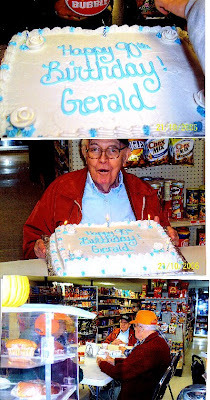 My Great Uncle Gerald died in October and he has been on my mind quite a bit since his passing. He was my Grampy Folsom's (Eldred) twin. I can conjure up his laugh and his big smile in my mind. He passed away 4 days before what would have been his 92nd birthday...on October 17th. My Grandfather (Mom's Dad), along with Uncle Gerald, Aunt Margaret and Uncle Cedric, were born and raised in Roundup, Montana. Over my years living in Montana, I feel I have had an even deeper connection with Uncle Gerald and the history of an old homestead in the eastern part of the state. The year Uncle Gerald's eyesight started failing, I agreed to take over the FOLSOM genealogy. He had worked and research for years and years as a pasttime to link our family back to the early 1500s in England. I hope to keep up all the work he put into this. If anyone has updates - give me a call or drop me an email! Washburn B (Burnie) Folsom was born July 10, 1888 in Monticello, Maine. His mother died when he was one year old. He was raised by his grandparents. On April 14, 1913 he married Fern Somerville at 1:00 in the afternoon. They left Maine that evening for Roundup, Montana to take up a homestead thirteen miles south of Roundup in the Bull Mountains. Their home for the summer was a board floor with four foot board side walls and a tent on top. Their home was built late that fall. Burnie cut props for the mines and Fern taught school. She has been a teacher in Maine, too. Their first child, Margaret, was born August 22, 1915. Their twin boys, Gerald and Eldred were born October 21, 1916. Another boy, Cedric, was born June 4, 1918. They had a family of four, all born in less than three years. In the fall of 1918 they had 409 head of cattle. Things looked good for the Folsoms until a herd of cattle from Texas were brought in that had Texas scab. It was a condition caused by a tick bite which caused water blisters to form and the cow would freeze to death in cold weather. They were put on the range with native cattle and the ticks spread through the herd. The weather was very cold, too cold to dip to kill the ticks so every one in the area had a big loss. In the spring when the weather was warm enough to dip, Burnie had 81 head left of the 409 he had in the fall. 1918 and 1919 were very dry, grass was scarce and hay was very high and scarce so the cattle were sold and the family moved to St. Paul, Minnesota. In St. Paul Burnie painted cars in a body shop for one year then rented a dairy farm, he sold milk and raised potatoes until 1924. He then moved back to Montana to the homestead. In 1925 the homestead was planted to wheat. He moved to Shepherd where he rented two irrigated farms. These were the second and third irrigated farms after the Crooked Creek flume, known as the Kenschler farm and the Winkelman farm. By this time the Folsom boys were old enough to handle most of the chores. We milked cows and fed the skimmed milk to calves and pigs. The cream was sold to Billings Creamery. We also raised hay and sugar beets and dry land farming in Hoskins Basin. We attended the Pineview School northwest of Shepherd. In fall of 1928 we moved to Ballantine. There we lived in what was known as Waterman house on the west side of town. At this time Burnie had cattle and sheep. They were pastured north of the Yellowstone River at Pickets Springs and the Crump Place. Alex Kenmonth had sheep herded with ours. In the spring of 1930 we moved to O’Donald Ranch, now known as the Vermillion Ranch. It is across the river from Huntley. We lived here until 1936. Due to drought and grasshoppers we shipped three double decked cars of sheep to Oakfield, Maine. Margaret Folsom married Robert Harper of Roundup, Montana. They moved to Maine in 1938. They had two boys and three girls. Robert died in 1980. He is buried in Monticello. Cedric married Goldie Stephens of Houlton, Maine. Cedric died in 1993 and is buried in Blaine, Maine. Goldie is living in Blaine. They had two girls and three boys. Eldred married Agnes Gardiner of Houlton, Maine. They have four girls. Eldred died in 1982 and is buried in Houlton, Maine. Agnes lives in Houlton, Maine. I married May Kirkpatrick of Danforth, Maine. We are both well at this time, October 1997, and live in Monticello, Maine. We have two boys. Burnie, our father died in 1966 and is buried in Monticello. Fern, our mother died in 1976 and is buried in Monticello. From living in so many places in Montana I have had the pleasure to know a lot of families. I have talked several times to Clyde Fleming of Huntley and got an update on a lot of the Project families and I am sorry to hear so many are gone. This is so dear and interesting. I am happy you have been involved with your ancestry. Isn't is eerie and comforting at the same time, to know where we came from? I love the tales of marriages, babies and moves to different places. These stories of those who have gone before us, make me appreciate how good we have it now, even when times are tough. Thanks for sharing! Thank you for posting this... I miss Grampy so much. I got teary just reading this..